Join us at the beautiful and historic Curtiss Mansion in Miami Springs for our FREE Family Double Feature (all ages welcome). A new twist on an all-time favorite. In this updated version, the Wolf and Red both learn some valuable lessons on the way to Grandma's house. Exciting and educational. This performance will be indoors. 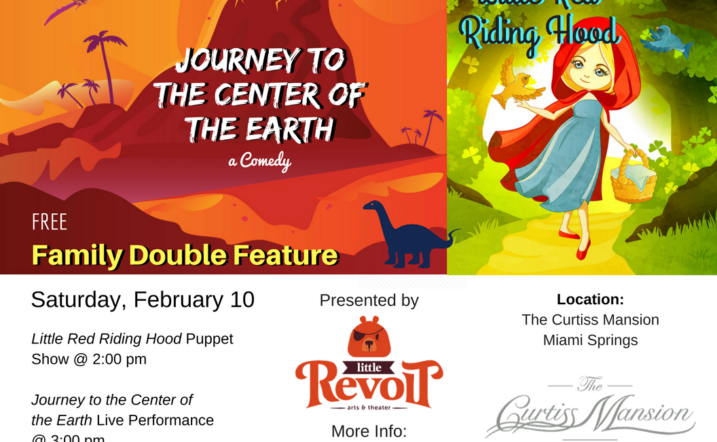 Join the actors from Little Revolt as they present a hilarious new adaptation of the classic Jules Verne novel Journey to the Center of the Earth. A group of explorers travels to the middle of the Earth where they encounter many adventures, including prehistoric creatures (dinosaurs!). This performance will be set outdoors. Chairs and blankets will be provided; guests are also welcome to bring their own. In the event of rain, we'll move indoors.